Woke Up This Morning guitar tab, as performed by B.B. King. Official, artist-approved notation—the most accurate guitar tab on the web. Need help reading standard notation or guitar tab? See our notation legend. 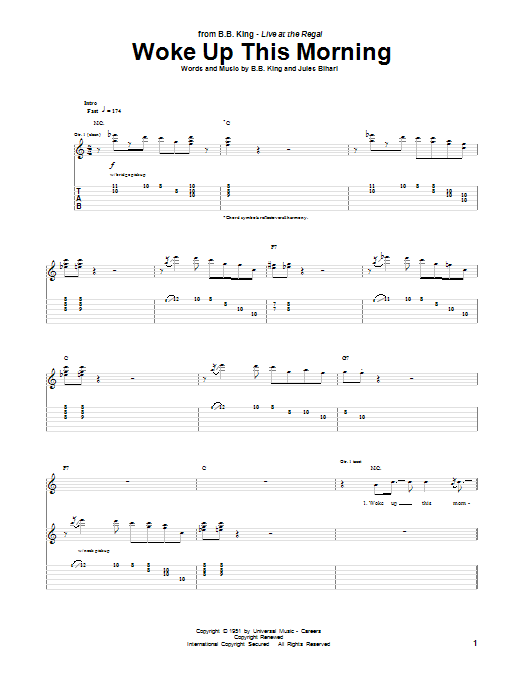 Professionally transcribed and edited guitar tab from Hal Leonard—the most trusted name in tab. Get this sheet and guitar tab, chords and lyrics, solo arrangements, easy guitar tab, lead sheets and more. Instant and unlimited access to all of our sheet music, video lessons, and more with G-PASS!